The 36th Legislature will have eight new members in the House of Representatives and 13 incumbents. 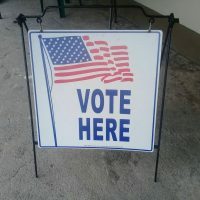 That’s according to unofficial results of yesterday’s mid term elections when the voters of American Samoa went to the polls to elect members of the local House, a delegate to Congress and a proposed constitutional amendment on the veto override power. Three incumbents had already been voted in before Election Day. Titialii Kitara Vaiau and Vailoata Eteuati Amituanai ran unopposed and Su’a Alexander Jennings was selected by Swains islanders for another term. Larry Sanitoa who outvoted Vui Florence Saulo to take up one of the two seats for Tuala-uta. In the congressional race Aumua Amata won by a landslide majority, winning 83.3 % of the total 8,638 votes cast while her two challengers combined received 16.7%. Aumua carried all 17 districts by large majorities in a lopsided race. The result was largely expected. Talking with John Raynar at her campaign headquarters last night Congresswoman Aumua Amata expressed her gratitude. And voters overwhelmingly rejected the referendum on the veto override power. Those who voted no numbered 5957 69.6% and those who supported it was 2,605 or 30.4%. The amendment which would have allowed the Fono to override the governor’s veto of a bill , instead of the Secretary of the Interior, was defeated in all 17 districts. Using the Election Office figures for the congressional race, only 55.5% of the total registered voters of 15,541, cast ballots.